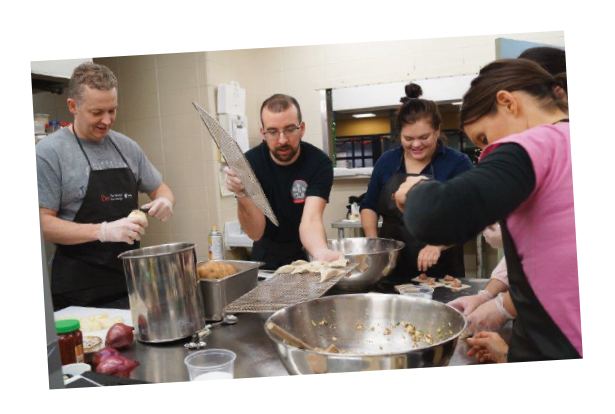 At The Table: Recipe for Change is a social enterprise catering company initiative at YWCA Hamilton, using fresh, local and seasonal ingredients while providing healthy meals and training opportunities to women and girls. The catering menu focuses on local and seasonal ingredients. Our philosophy is that great food can be simple yet delicious. We feature fresh, healthy, high-quality food. In addition to our menu, we offer a wide range of custom catering options for any event, large or small. Several years ago, a resident living in the YWCA Hamilton's Transitional Living Program participated in our collective kitchen. The concept of the collective kitchen was that women from the Transitional Living Program would create menus, shop, cook, and eat their meals together. One woman made a very memorable comment that resonated with the staff for years to come - she commented on how great the food was and how wonderful it was to eat a meal At The Table as that marked the first time in her life she enjoyed a meal with others. Join us at the table as we work together to improve the lives of women and girls in our community.